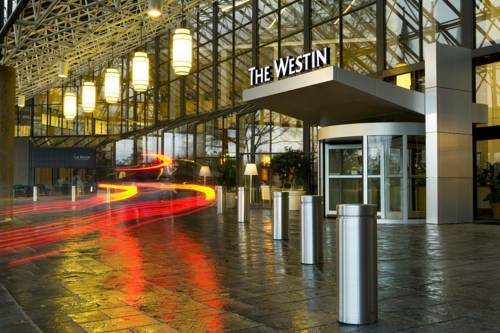 Experience complete rejuvenation at The Westin Atlanta Airport. Business and leisure travelers will be welcomed with a contemporary yet soothing atmosphere designed to help you revive, refresh, and relax.A short complimentary shuttle ride from Hartsfield-Jackson Atlanta International Airport (ATL), The Westin Atlanta Airport is adjacent to major interstates I-85 and I-285 and just minutes from the Georgia International Convention Center. The hotel is only eight miles from downtown Atlanta and area attractions, including Turner Field, home of the Atlanta Braves, and the Georgia Aquarium.After a long day of traveling, guests will appreciate one of our 500 guest rooms and suites. Featuring our signature Heavenly Bed and an oversized work desk, theres plenty of space to spread out. For guests who have allergies or asthma, our hotel offers PURE Allergy Friendly Rooms. State-of-the-art features drastically reduce irritants, such as allergens and bacteria, in the air and on all surfaces and fabrics, helping you awake refreshed to enjoy the day.Revive your spirit in our 10-story lobby atrium, with beautiful marble, glass, and foliage. Relax in our outdoor heated pool or reenergize at our WestinWORKOUT Fitness Studio. Enjoy 24-hour in-room dining, savor contemporary southern cuisine at Cecilias Southern Table, or grab Starbucks coffee on your way to the airport. During your stay, be sure to take advantage of BAGS, our unique airport skycap service located in the hotel lobby. Open daily from 6am to 2pm, this affordable service allows departing guests traveling domestically on American or Delta Airlines to receive their airline boarding passes and check their baggage directly from the hotel. Cecilia s Southern Table offers contemporary southern cuisine in an attractive atrium-style setting. The newly designed Revive is a grab n go outlet offering Starbucks coffee and a variety of light fare for the time-conscious guest. The sophisticated Martini s lobby bar offers the finest in wine, top-shelf beverages and imported beer to create a dining and entertainment experience that will become immediately popular with both locals and guests.